Nick had really only been doing CF for about 6 months, but his eating was pretty typical for most individuals that come our way. Inconsistent eating across the board, lacking in overall protein consumption, and under-eating calories as a whole. 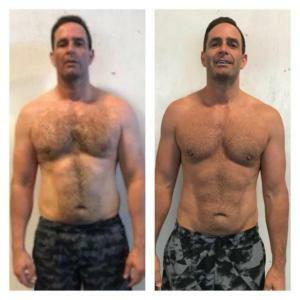 Throughout the WHOLE process, Nick never gained more than 3-5lbs from his initial starting weight and often fluctuated LOWER than his starting weight, but the progress pics every few weeks NEVER showed any sign of “weight gain”. As we built food, he continued to LEAN OUT, get more shredded, and not really change the weight on the scale much. Also, we improved sleep quality, energy, workout performance, and RECOVERY!! PLUS, he ended around the same weight we started at. However, the pictures show a MUCH different story than the scale….So what is the take away from this? Building a proper QUANTITY of food will NOT make you fat, it will actually make you become more of a BEAST. - Nick Hired a nutrition coach- Nick now understands how to eat according to his life stressors- Nick is now happy about his current state, and wants to continue building muscle and leaning out! If you wanna be like Nick, let me or Coach Megan Jones know!! A little about Mr. Bobby. He is a full-time teacher and coaches volleyball NON-STOP. So it’s safe to say his schedule is hectic and he has minimal free time. This kind of schedule is tough and led him to overall UNDER-eating and inconsistency in his workout habits. Not to mention HIGH stress and lack of sleep. Our main goal was to rebuild Bobby’s metabolism to withstand the demands of his life and make sure he was feeding himself properly to recover and take his fitness/health/physique to the level he wanted. Flash forward 6 months, literally, all we have done is ADD MORE FOOD, build better habits around his lifestyle, and teach his body that he WILL take care of it with proper food! The Result? MORE ENERGY, MORE CONFIDENCE, BETTER SLEEP, LESS STRESS, and a loss of a total of 18lbs!! Not to mention, he is crushing workouts on the daily and feeling like a brand new man. Yes, you read that right. WE ARE FEEDING HIM MORE THAN EVER and he has lost weight/gotten more shredded/is performing better in all aspects of life. Once again, the modern world/society of starvation diets and over-training is OUT, and teaching better habits and ACTUALLY EATING FOOD IS IN. 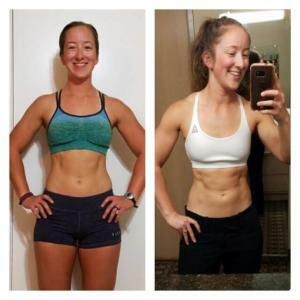 I am BEYOND excited to share this post with you, not only because it is nothing short of spectacular, but because I know how CRAZY this girls schedule is with her new job and she STILL is able to crush her macros and exercise LESS than normal and have some amazing success. I cannot express how proud I am of her and the dedication and drive to always better herself! Kenna has been a member of Infernal for a few years now and has dabbled in the nutrition group a couple times in the past. However, this last time her work and gym schedule has NOT been anywhere near the same. Her attendance at the gym has been less, her travel/stress for work has increased, so most would think this would lead to weight gain/loss in physique, right? WRONG! What Kenna was able to achieve in about 3 weeks time JUST THROUGH EATING with minimal working out is a 100% testimony to her dedication to nailing her food and trust in her Coach Megan Jones to make the right changes! People, when they tell you diet is 80% of the battle, let this transformation be the evidence! Just working out more and eating less WILL NOT yield you any long-term healthy results! Shoot, it most likely won’t even do anything in the short term! You know what the best part about this was? Kenna achieved these results BY EATING MORE FOOD. Not by starving herself, and working out 7 days/week. MASSIVE transformation here from my man Chris Brewer! I cannot begin to explain how phenomenal this has been given his situation. Coach Megan Jones must be using some witchcraft. First off, this transformation took place over about a 6 week period. HOW YOU MAY ASK?! Simple. A proper quantity of food, massively improving sleep, and being very diligent on hitting his Numbers. NOT INCREASING EXERCISE, lowering calories, or cutting carbs. Before Chris found the program he was eating out and drinking alcohol multiple times a week, while only sleeping around 4 hours/night. So, by simply cutting his eating out and drinking down to 1 meal/week, his weight started peeling off. Not only the scale changed, his physique massively improved, his energy levels increased, and his sleep improved to closer to 7 hours/night. You might as, “Was this necessarily the diet that helped Chris through these 6 weeks”. The answer is YES. But I think more than anything the accountability of a coach to be watching your every move and calling it on your provides a TON of motivation. Meet my man Mike Smith. He is 47 years young and I think has just re-written the laws of physiology! The progress you see here occurred over about an 8 week period, and when I say progress I mean increased energy/performance and shredding fat. AT 47!! 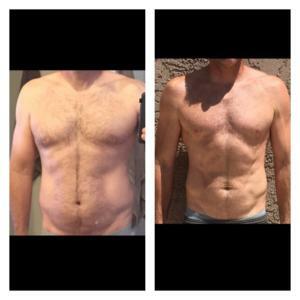 Mike came to us feeling sluggish in his daily life and workouts. He had been trying to drop some weight for some time now and ended up trying different fad diets/cutting calories (sounds familiar, right?). Upon his food logs, we knew exactly how to help him, GET HIM MORE FOOD! 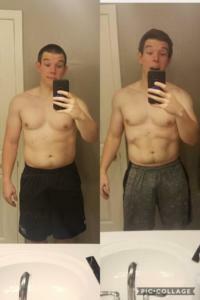 For most, this is a struggle going from eating very little to us bumping up your food, but this dude COULDN’T STOP EATING, and couldn’t stop losing weight. The moment his body felt he was feeding it properly, his metabolism caught fire and started burning through everything he put inside his mouth! 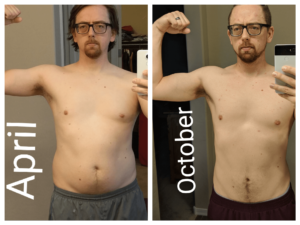 As the weeks went on, Mike’s food kept increasing and we continued to improve his energy levels, get him better sleep, and fuel him to keep crushing workouts. Needless to say, his life became very enjoyable.